Landscape Creations has enriched many outdoor settings of residential homes throughout Chicago’s suburbs in both practical and aesthetic ways, and gained invaluable experience in creating outstanding surroundings with the use of stone in landscaping. As exceptional landscape architects, we are familiar with the myriad of details to consider in design of outdoor spaces. Landscaping with stone draws on a very natural aspect of your land, and enhances curb appeal. Stone landscaping products are abundant, and can be utilized in pathways, retaining walls, terraces, patios, pool decks, porches and benches. Raw stone includes materials such as crushed rock, cut stones, flagstone, lannon stone, outcroppings, patterned blue stone and boulders. 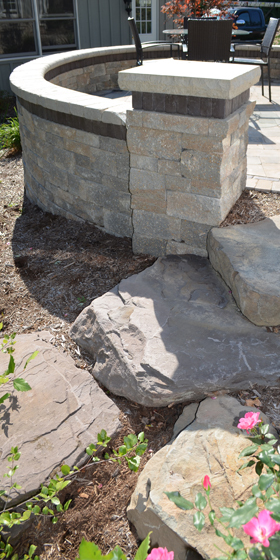 Stone landscaping elements can bring striking interest to any exterior area. There is a vast array of stone products on the market today in different shapes, sizes, and eye-pleasing colors to accent virtually every facet of your outdoor refuge. Stone Patios can be incorporated into almost any place in your environment – a sheltered area, directly adjacent to your house, near a shade tree or other standout landscape component. Stone patios can be built on various levels, creating a functional terrace effect. Stunning appearances are achieved by adding benches, walls, and different shrubbery to achieve an exciting view. Stone Walls or Retaining Walls can be attractive as well as highly practical. At low heights, stone walls can provide an outdoor bench. If your area is restricted in size, a wide stone wall blended into the fall of your yard can also serve as steps. Outdoor Stone Kitchens add immediate enhancement to your home and can be equipped with sinks, refrigerators, and stovetop burners, or the more traditional outdoor grill. You can have complete cooking capability right in the privacy of your back yard. Whatever landscaping goals you have, we make sure the materials blend well with the nearby surroundings, and are well suited for their intended use. High traffic areas, pathways, paved walkways or patios should use smooth stones that are not slippery when they become wet. 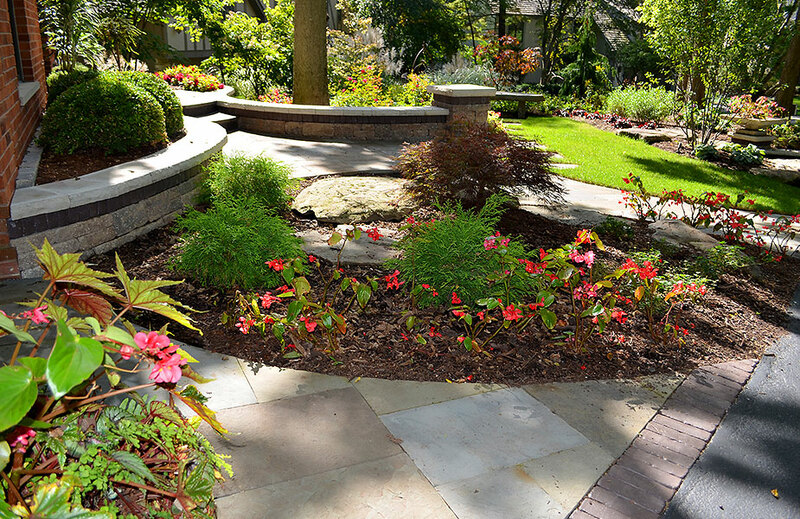 Using light-colored stone landscaping will brighten heavily shaded areas. Dark colored stones are better utilized in a sunny setting, and can diminish the brightness. Unilock® now offers natural quarried stone products in addition to their product lines made to look like stone. We are a Unilock®, authorized contractor, and encourage our clients to consider Unilock® products. We also offer Unilock® Elements. These are prebuilt design features such as outdoor fireplaces, grill islands, water assemblies, and brick ovens. Pre-built Elements are designed to complement and blend with each other, providing that well-coordinated look and feel to your outdoor living space. If you’re planning a backyard landscaping makeover, please visit our backyard landscaping page for additional tips and info. To further explore your customized landscape design idea, contact us today at (630) 932-8966. We are a member of the Chicago area Better Business Bureau, and carry an A+ rating. Read about our awards and customer testimonials.